Yesterday I promised a friend to talk a little deeper about the solar wind, so it’s time. 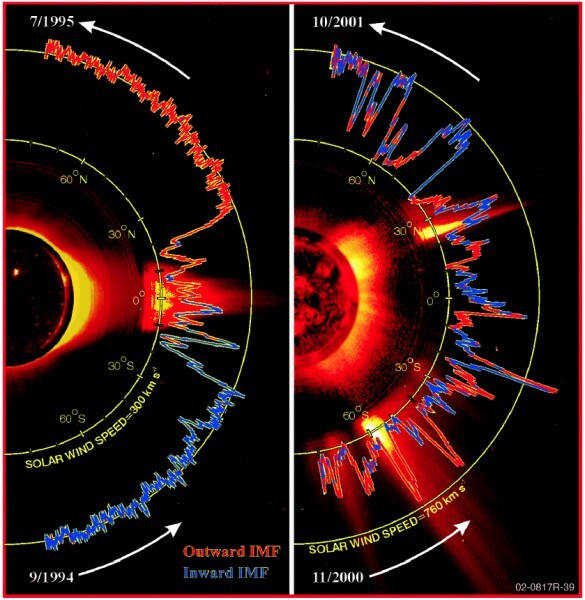 As I said, the solar wind (which happens in all stars, is not a unique feature of our Sun) is a stream of particles emanating from the chromosphere of any star. This consists of several elements, energetic particles, electrons and protons. Really they are electrically charged protons and electrons escaping from the chromosphere. Note that among these particles, particles called alpha there are two protons and two neutrons bound, highly radioactive that are emitted by a nucleus of 238 protons/neutrons. That is, due to the energy (big, fat, huge noses) high-mass particles (238) decay by emitting helium-like (in fact it is helium) with 2 protons and 2 neutrons. Many of these particles are ejected from the chromosphere for his energy back to it due to the magnetic field of the star in question, but others, with much more energy, shoot out projectiles forming the solar wind. The speed of the solar wind, said particles varies widely depending on the amount of magnetic field that have escaped (obviously) but are usually between 500 km/s to 1500 km/s. Thus using the average is around 1000 km/s. Remember that more speed, higher temperature and therefore more energy. They are very hot particles ranging between 1.8*10^6 degrees Kelvin to 9*10^5 Kelvin. That is, if you get caught or caught something along the way, they take ahead scorched. Gas clouds, nebulae, are similar to the solar wind composition so that there can draw a “formula” that tells us the density (number) of particles there are per square meter and therefore the pressure same. To give you an idea, the slower, denser, although not think that ye are like soup but rather, the denser solar wind is not even air. If we measure our atmosphere and we believe having 1 atmosphere pressure (yes, it is a unit), that are about 101325 Pascals, because the solar wind is a (normal) density of 4*10^-9 nPa (nano Pascals). A pittance, but something is. The problem is that even being a pittance (in our Sun, remember that each star is a bit different) is very dangerous because it has ability to get the atmosphere of a planet, raze their energy lives on and leave as a Waste Land. Hence planets have magnetic fields really have a shield that deflects these particles so as to avoid impacting on the planet.